This Post of the Day is on efforts to adopt self-defense immunity laws in Indiana and Tennessee. I’m a huge fan of self-defense immunity laws, primarily because they provide an alternative means of arguing self-defense justification in a pre-trial setting that is far less costly and far quicker than a full-blown trial. This can really mitigate the risks of the legal process itself being used as the punishment in cases where self-defense is a robust justification for a use of force against another. The Indiana bill, HB 1284, is embedded at the bottom of this post, and seeks to enact civil self-defense immunity in the Hoosier state. Specifically, it bars civil suits for injuries suffered by a person (or the estate of a person) who was committing a felony or causing serious bodily injury, if the user of force claims the injuries were the result of defensive force, and the person injured is unable to disprove that claim of justification by clear and convincing evidence. Clear and convincing evidence is a standard of proof that’s greater than a preponderance of the evidence, and less than beyond a reasonable doubt. Note that in a civil suit the party disputing a claim of self-defense would need to disprove self-defense by only a preponderance of the evidence. As a result, the person claiming self-defense is actually provided greater legal protection in the self-defense immunity hearing than they are in the civil suit itself. 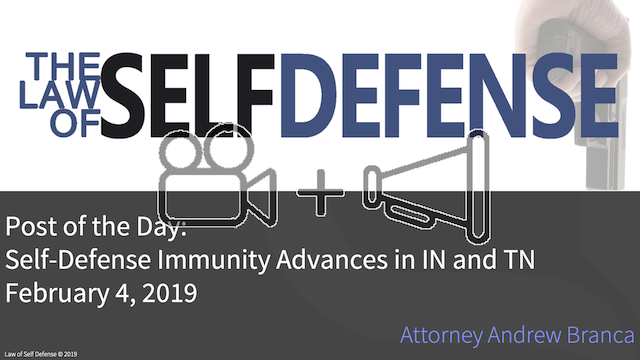 The determination of immunity is to be argued in a pre-trial self-defense immunity hearing, which provides a much less costly and much more timely mechanism for determining self-defense justification than would be provided by a trial. It also provides that if immunity is granted, the person who was sued shall be awarded reasonable attorney’s fees and legal costs. Note that this bill provides for civil self-defense immunity only. It does not address criminal prosecution, which is a substantial shortcoming. Nevertheless, better a small gain for law-abiding defenders than nothing. Naturally, opponents of HB1284 are unable to challenge the bill on its merits, and so are forced to resort to lies. In particular, in a hearing on the bill held last week Democrat Rep. Ryan Dvorak claimed that the bill would prevent an innocent bystander from filing suit if injured by a defender’s bullet. That is simply untrue, as the bill specifically prohibits suits only by persons committing a felony or causing serious bodily injury. A better question is why immunity protection is limited to felony/serious bodily injury scenarios, and not extended to non-felony, non-serious bodily injury scenarios, but I’m afraid I’ve no answer for you on that one. The good news is that the Tennessee bill provides protection to the law-abiding defender from both civil suit and criminal prosecution, and that’s huge. Unfortunately, the summary doesn’t provide any details on the procedure to be followed in seeking immunity, although it would presumably involve a pre-trial self-defense immunity hearing. The summary also does not tell us what standard of evidence is to be applied in determining immunity—Preponderance of the evidence? Clear and convincing evidence? Nor does the summary explain who bears the burden on that issue—does the defender have to prove self-defense, or does the plaintiff or state have to disprove self-defense? As always, if either legislature would care for input from this small town self-defense lawyer on how best to draft their bills, I’d be more than happy to offer my suggestions. In parting, remember: You carry a gun so you’re hard to kill. Know the law so you’re hard to convict. See Minnesota 611A.08 enacted in 1993. The first? Th TN legislative site does give full text of bills, but you have to know to click on the bill on the page . You also have to search for bill in the correct format … HB0409 /SBXXXX. Right now this bill has no Sponsor in the Senate shown. I am going to start working on that. Thanks, Steve. Howard K. also pointed me in the right direction, so the draft of TN HB0409 is now also embedded in the post.